Vittal, Aug 05, 2014: Two open bore wells close by the bus stand at Kukkaje in Maanila village of Vittal are dangerously lying open, revealing the complete apathy of the local administration, even when there are standing examples of such borewells claiming the lives of children as in case of the Bijapur tragedy and the more recent case of Bagalkot wherein the rescue teams are struggling to get out a six year old boy who fell into an open well. In Maanila, if one borewell is close by the bus stand, another open borewell is nearly 15 meters away. To add to the problem, an Anganavadi centre is also located behind the bus stand and children pass through this area itself enroute the Anganavadi. It is learnt the Borewell was drilled around 10 years ago but is rendered useless since the past three years. 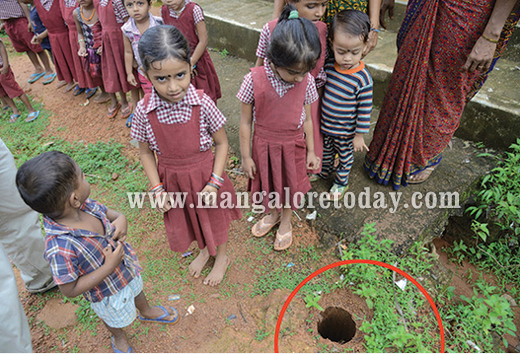 Though the borewell hand pump has been removed by the authorities, no effort has been made to close the hole that is wide open and is making a mockery of the apathy of our authorities.